I have a number of vining plants that are vigorously growing in the heat of late spring here in North Carolina, and I thought I'd share some photos here. If you look closely, you can see the ornamental gourds on the left are starting to reach for the lower branches of the oak tree. On the right, the cucumbers are going a little slower, but they were started later too. The morning glories on the right have already started to cross the top of the bench. The cardinal climbers on the left are a little less vigorous, but they've finally started going too. I guess I won't be moving this bench again for the rest of the summer! Champion Pumpkins, which I planted too early. Look, I already have a pumpkin! So I have six cucumber vines in this planter. That's at least two too many. They are really sucking up the water and I am they need a full dose of water every day! I feel like I should give them some hydro n utrients! Newly installed cattle panel trellis for the pole beans. I need to use some rope or something to straighten it up a bit. Just planted the beans this weekend. I also planted a tomato and some sweet bell peppers here. Here is another Champion Pumpkin, growing in a 5 gallon bucket! Something is lacking about the blog entry title.. I guess it doesn't translate well into text! So, my tomatoes are doing very well so far! Even the one that fell over a couple weeks ago before I strung it up seems to have survived the stalk crease, no worse for the wear. As expected, the Early Girl variety already have big plump tomatoes on them. These two plants started as fairly large seedlings that I purchased from the Farmer's market, so they had a bit of a head start on my own seedlings. You can also see my pickling cucumbers next to it there, also doing fairly well. Tired of of the summer heat killing various parts of our fescue lawn every year, we opted to swap out the fescue for bermuda! We did the back yard (inside the fence), along with all parts of the yard outside the sidewalk. We haven't had grass HERE in 5-6 years! I didn't actually intend for them to do the part on the right... but it looks nice. Here are some photos from the garden this morning! Click on the first one and you can enlarge and go through a slideshow. Rubbermade Tote with cucumbers, basil, and a "Mucho Nacho" jumbo jalapeno. First tomatoes, as expected, on the "Early Girl" variety. Blueberries galore! One of these plants is doing better than the other. Tomatoes are strung up and ready to reach for the sky, peppers and eggplants caged. Zucchini, only three weeks after transplant! Dill and Lemon Basil along the back. Celebrity Tomato in the pot, bunching green onions, garlic chives, yellow onions, a couple peppers, and "Better Bush" tomatoes. Tallest pea vines ever! Plus Broccoli, Oregano, Garlic Chives, Dill, Rosemary, and Cabbage. Also planted two little nasturtiums next to the broccoli. Zucchini, slicing cucumbers by the trellis, and catnip. On the trellis, ornamental gourds, plus sage, parsley, and texas taragon. Good morning gardening friends! I haven't posted much lately, but the gardening is going very well so far this spring! We had some 90 degree heat last week for a few days, and several of my plants soaked it up and went bananas - particularly the zucchini, which will have harvestable fruit on it in probably a week!! I bought a bunch of hot peppers at the Farmer's Market last weekend to fill out my garden - I purchased Cayenne, Jalapeno, Poblano, Thai Dragon, Habanero, Carribean Red Hot, and Bhut Jolokia. The latter is also known as a Ghost Pepper, and from time to time has been known as the world's hottest pepper. I also have a couple of Big Bertha bell peppers, and I have two Jupiter bell peppers that I haven't transplanted yet. The Ghost Pepper rates anywhere from 350,000 to over 1 million on the Scoville Scale, a system that measures that amount of "heat" a pepper has. Habaneros, which are the hottest peppers you can buy in the grocery store, usually rate between 100,000 and 350,000 - I have eaten habaneros straight before, and I made some really awesome jelly from them last year. More recognizable, the Thai Chili scores a 50,000 to 100,000 ... cayenne from 30,000 to 50,000, Jalapenos from 3,000 to 8,000, and the Poblano only 1,000 to 2,500. Bell Peppers have no heat at all and score a 0 on this scale. Honestly, I don't know if I'll try eating the Bhut Jolokia peppers. I doubt it. I bet they'd make some hellishly spicy jelly though!! I don't subscribe to caging tomatoes. 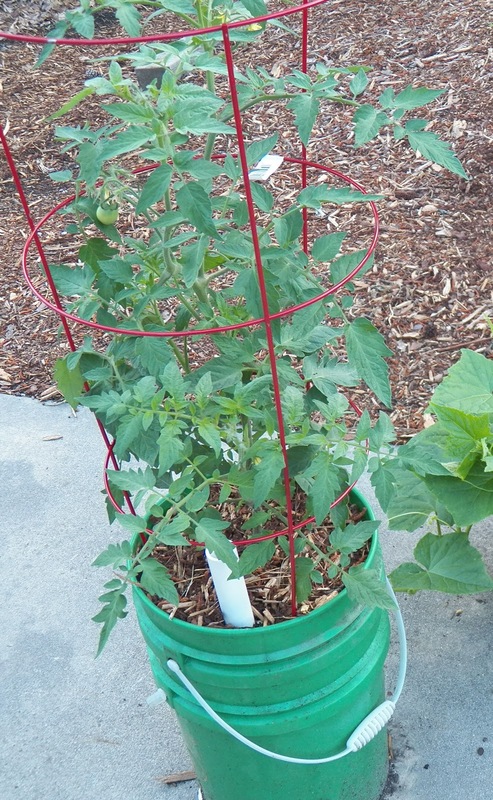 The tapered tomato cages you see at the big box stores aren't anywhere near big enough for a tomato plant, as most tomatoes will get 5-6 tall or higher. They are suitable only for caging "determinate" tomato plants or "bush" tomatoes. These types of tomatoes will usually only get 3-4 tall. I have several varieties of bush tomatoes planted. Two of them are "Better Bush" which will allegedly get about 4' tall and the main stalk is so sturdy that they won't even need to be staked. I don't know about that - we'll see! The other are "Celebrity" which I grew with good luck last year in the garden. This year I have them in large containers, and these do need some support, as they will be quite laden down with heavy tomatoes! 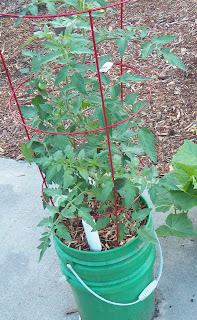 Since they only get 3-4' tall, the standard tapered tomato cages work fine for these. Just make sure you know what kind of tomatoes you have and how tall they will get. If they are "indeterminate" they will almost certainly outgrow these types of cages and you'll be left with a wrangled mess! I have found, however, that peppers and eggplants can use some level of support, especially as they get older and get heavy with peppers. Even the branches of the smaller cayenne and jalapeno can droop under the weight of a bountiful crop! And certainly eggplants need lots of support! Since most pepper plants only seem to get 2-3' tall, these tomato cages are perfect! I planted asparagus crowns in an old unused raised bed a few weeks ago. This bed gets partial shade in the summer - sunlight really from mid day through evening, and doesn't get a lot of sun in the winter. while I love asparagus, I don't like plants that take up a lot of year round growing space without a lot of production, as I'm limited in space. I'm hoping that the asparagus does well here, but if it doesn't - oh well! The bed is a little over 2 feet wide and 8 feet long. It's also 8" deep. Underneath the 8" of soil is clay and pine tree roots. Not the friendliest of environments probably. I didn't amend the soil really when I did my planting, though it's loose and filled with organic matter - a mixture of bark and dead roots from previous plantings. Not sure how rich the soil is. I planted the crows about 6" down (I didn't want them sitting right on top of the clay base). Several of the crowns have started growing and have popped well above the soil. I need the bed to be deeper, so I spent a few dollars at Home Depot for a 12' 2x8 and an 8' 2x8, so I could make an 8" tall addition to the bed. I'd only planted asparagus in about 6' of the bed so I'm leaving the other 2' at its normal depth. 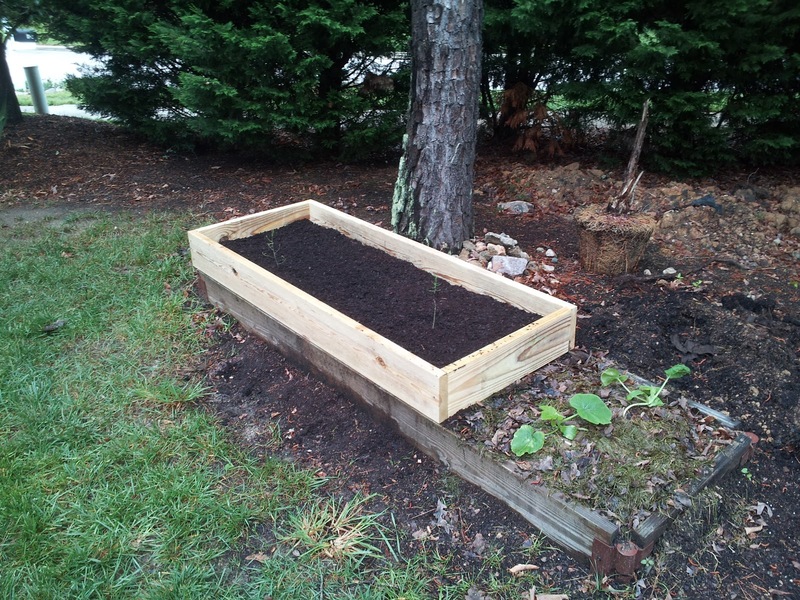 After completing the additional frame, I laid it on the bed, and carefully added more garden soil. In a few weeks, I'll probably top this off one more time with some good rich compost, in hopes that the nutrients will soak down through the layers of the bed. Before I few weeks ago, I'd never heard of Cattle Panel. Now, I know it as an immensely cool thing to use in my garden! To start, cattle panel is approximately 4 feet wide and 16 feet long. 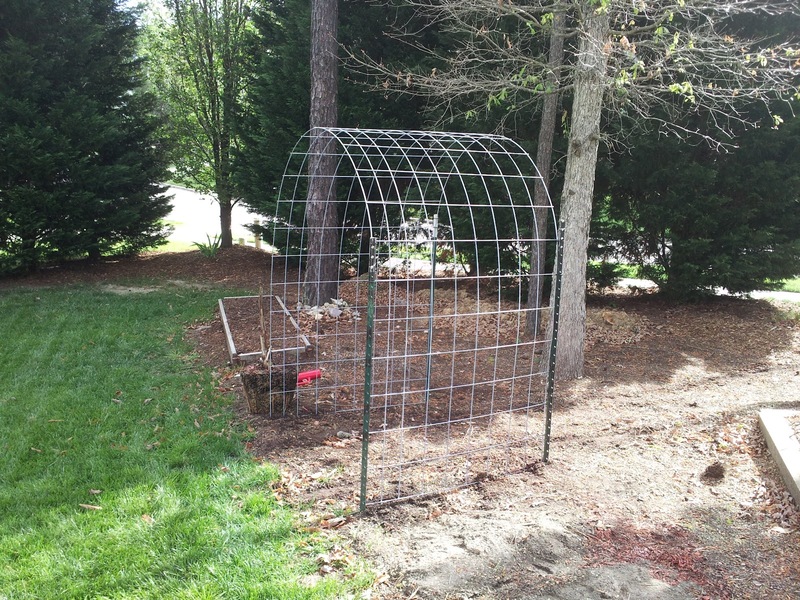 It is made of galvanized, heavy gauge wire - much sturdier than your average garden fencing. It's galvanized so it won't rust like concrete reinforcing wire. It's not typically sold at Home Depot, but here in the Raleigh area, it's sold at both Tractor Supply and Agri-supply for between $20 and $25. Cattle Panel Arch Trellis in my garden. 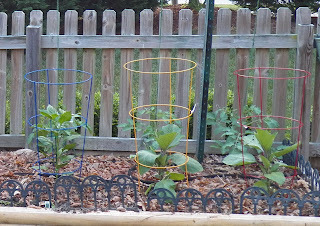 Of course, it would make an excellent vertical trellis for just about any vegetable, but especially so if you're growing heavier fruits vertically, like canteloupe and those sugar baby watermelons. If my wife would let me, I'd put in a 2'x16' bed and use this as a cucumber trellis. This makes me wish I had a bigger yard, I want a cheap, low cost greenhouse too! Eric also built a chicken coop out of Cattle Panel. Zucchini, dill, and lime basil on the left. 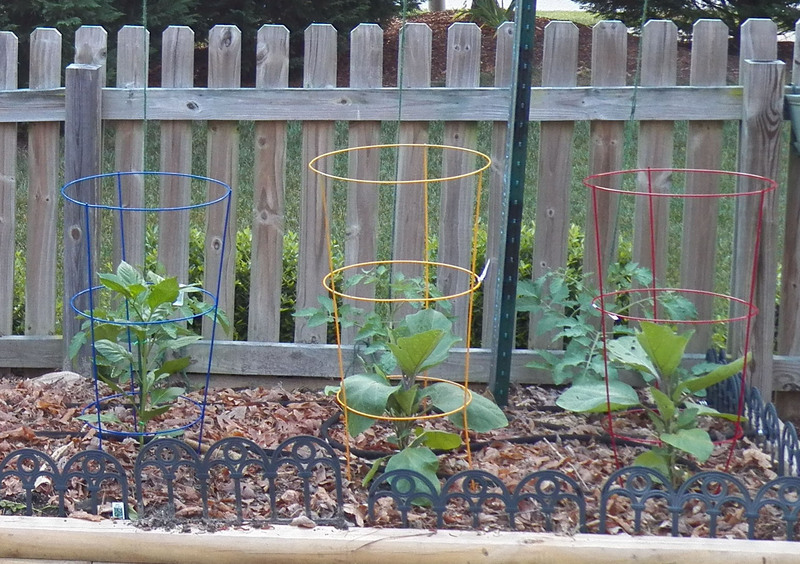 Cucumber seeds planted below the trellis on the right, along with some empty space. Celebrity tomato in the pot. Bunching green onions, yellow onions, romaine lettuce, one cabbage plant (Early jersey), and two newly purchased "Better Bush" tomatoes. Peas with lots of blooms! Hope they finish up soon as I need this space! On the left, small fruited ornamental gourds, parsley, some "Big Smile" sunflowers, and a Champion pumpkin. On the right, straight 8 cucumber seedlings, zucchini seedlings, and a catnip plant. Added more wall here and filled it in with good compost blend garden soil. Along the front edge, I planted creeping thyme and onion chives, with a row of Zinnie's behind that. Along the right, 2 rows of Big Smile dwarf sunflowers. Might put some kind of trellis in empty space there and plant a climbing rose.